In just over a month, people in New Hampshire will vote for their parties' nominees for governor. 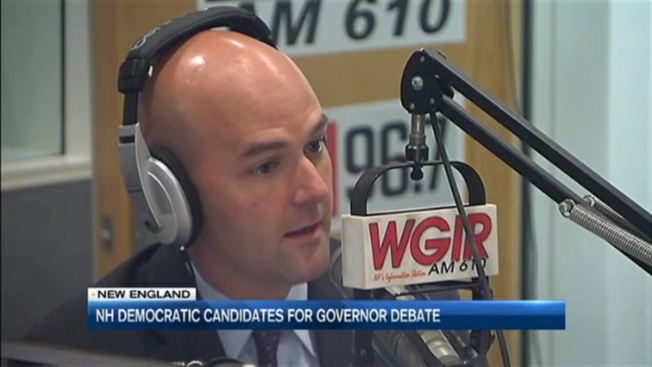 Wednesday, it was the Democratic candidates' turn to make their voices heard. All three candidates support the repeal of the state's death penalty and the decriminalization of recreational marijuana, but to what extent? Former Portsmouth Mayor Steve Marchand says he's all in. "I'm the only candidate in either party that favors the legalization, regulation and taxation of marijuana," he said. "I'm the only candidate 100 percent opposed to Northern Pass, 100 percent opposed to the death penalty." New Castle business owner Mark Connolly made his voice heard on gun control, saying it's time to ban semi-automatic weapons. "I think I am the only candidate that said directly, if elected, I will lead the charge," he said. Connolly says with 38 years in the public and private sectors, he has more experience than his opponents combined. But as a former mayor, Marchand says he knows what it takes to be a leader. Executive Councilor Colin Van Ohstern says he's been a key player in the state's recent progress, and that his record should speak for itself. The four Republican candidates sat in the same seats last month.